THE INTERNATIONAL REGION'S TOM VONIER FAIA ELECTED AS THE AIA'S 2017 PRESIDENT! Delegates to the American Institute of Architects (AIA) national convention in Atlanta elected Thomas V. Vonier, FAIA, (AIA Continental Europe) 2016 AIA First Vice President/2017 President at AIA. Jennifer Workman, AIA, L. Jane Frederick, FAIA, and Anthony P. Schirripa, FAIA, have been elected to serve as the At-large Director; Stuart L. Coppedge, AIA, has been elected 2016–2017 Treasurer. Currently serving as 2014–2015 AIA Vice President, Vonier is also the founder and past president of AIA Continental Europe from 1994 to 1995. He served on the AIA Board of Directors representing the AIA International Region from 2010 to 2012. Vonier received an M.Arch. and a B.Arch. from the University of Wisconsin-Milwaukee after attending the school of architecture at Washington University in St. Louis. He is also currently Secretary General of the International Union of Architects, after previously serving as its Vice President. Tom Vonier was also instrumental in the creation of the Middle East Chapter and continues to be a strong supporter. Tom Vonier and Thierry Paret will be the only two serving board members from the international region (AIA Continental Europe Chapter and AIA Middle East Chapter). The votes have finally been vetted by the AIA's Legal Counsel for the offices of First Vice President/President and Treasurer for the International Region. 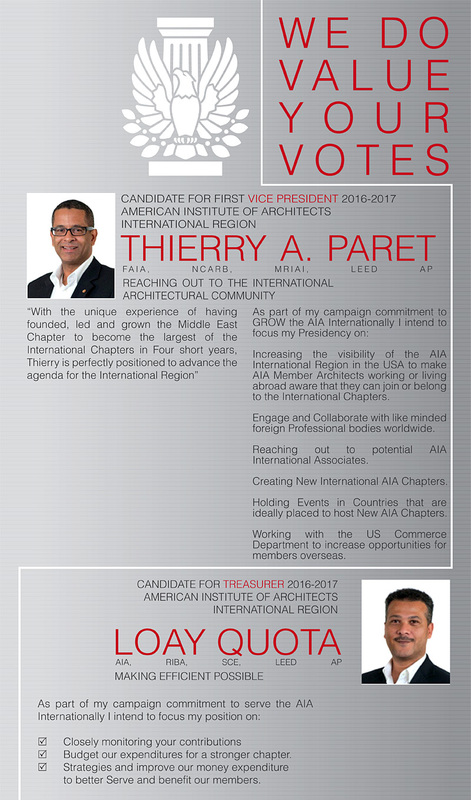 Thierry Paret, FAIA was elected as First Vice President for 2016-2017 and President for 2017-2018 and Loay Quota, AIA was elected as Treasurer for 2016-2017. The two former AIA Middle East Chapter Presidents will work with the International Region's board of Directors to further develop the AIA's international initiatives. On July 30th AIA ME inaugurated its presence in Egypt with a presentation and tour of Bibliotheca Alexandrina. The American Institute of Architects (Middle East Chapter) has expanded from its origins in the UAE to 9 MENA countries over the past 5 years, with Egypt being the home of the most recent extension of the chapter. Its mission is to extend the services of the AIA—headquartered in the United States—to its members in the MENA region and to uphold a high standard of design, education, and professional practice among its members. The AIA ME seeks to foster an understanding of the differences in professional practices between the US and the Middle East. It also aspires to foster communications between AIA and its members who work and reside in the Middle East. The votes have been vetted by the AIA’s Legal Counsel in Washington DCfor the offices of First Vice President/President and Treasurer for the International Region. Thierry Paret, FAIA was elected as First Vice President for 2016-2017 and President for 2017-2018 and Loay Quota, AIA was elected as Treasurer for 2016-2017. The two former AIA Middle East Chapter Presidents will work with the International Region’s board of Directors to further develop the AIA’s international initiatives. Please show your support by completing the attached PDF proxy form which you can find here. We thank you for your support in electing these two founding members of the AIA Middle East Chapter who will work tirelessly to enhance services rendered to you by the American Institute of Architects. The Board of the AIA Middle East thanks you for your very important and continued support. We ask for your help in ensuring that your needs continue to be represented on the AIA International Region Board. In order for me to vote on AIA business that represents YOUR BEST interest we need YOU to complete the proxy form by filling in your name, membership number and signing your name. To make it as easy as possible we have the form available either in PDF or WORD for you to download. Once you have completed the form, please attach the document as a PDF and send the email to AIA Senior Vice President and General Counsel Jay Stephens at jstephens@aia.org. Please also copy AIA Middle East President Tannar Whitney, AIA at tannar.whitney@aiamiddleeast.org on the same email. All proxy forms must be received no later than Thursday, May 7, 2015, at 5:00PM (US Eastern Daylight Time). The Board of the AIA Middle East thanks you for your very important and continued support. We constantly strive to improve our services to you our valued member(s). 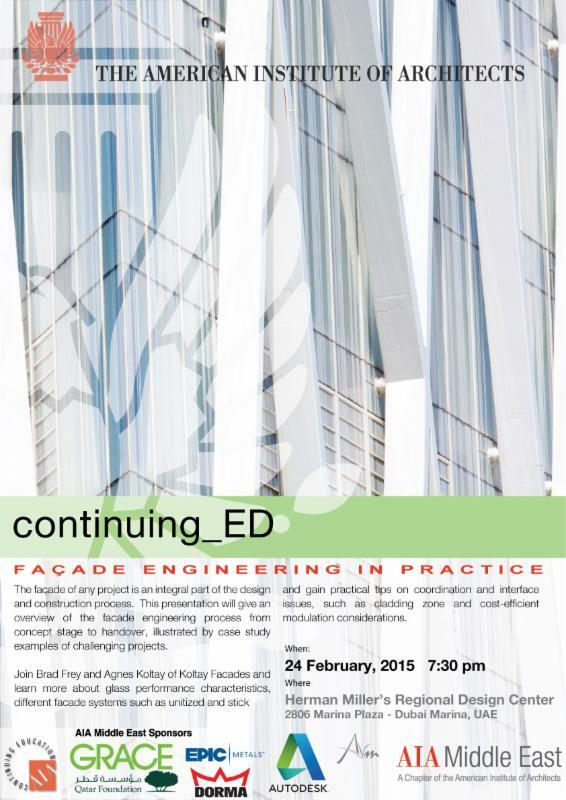 Join AIA Middle East on February 24at 7.30PM at Herman Miller's Regional Design Center in Dubai for a presentation by Brad Frey, Facade Consultant at Koltay Facades, who will give an overview of the facade engineering process from concept stage to handover, illustrated by case study examples of challenging projects. Please RSVP to raya.ani@aiamiddleeast.org for an accurate headcount and to register your name with Herman Miller! Damistan Village, Bahrain. January 2015. AIA Middle East Chapter collaborated with Mawane to hold a series of events in January which were part of Mawane’s first cultural season [in]Accessible that started on Thursday 1st January 2015 and continued till 31st January. The events were talks and a movie screening that highlighted issues in cities around the world while exposing contemporary spatial practices and the consequences they have in cities. The invited guest speakers presented talks followed by workshops from their experiences, emphasizing their diverse approaches to accessibility of the city. In the first week Ayesha Agha Shah discussed the importance of documentation to provide access to knowledge about the city in her lecture titled Significance of Documentation and Recording of Heritage. Ayesha explained the methodology used in the process of documenting historical buildings and shared her professional experience in the documentation process of Frere Hall building, which is located in Karachi in Pakistan. In the second week a movie screening of Pruitt-Igoe Myth: an Urban History was held under the patronage of the American Embassy. Both the moviemakers Chad and Jaime Freidrichs were present to offer a background on American urban development at the time of construction. The movie aims to break away from the cliché of it being an example of the failure of modern architecture. It looks at the wider context that has led to the failure of the building in addition to uncovering some successful aspects in Pruitt Igoe. In the third week Waleed Shalaan presented through his talk Junoot Eco Resort in Oman unconventional building techniques that can change the city fabric. Waleed gave an explanation of the goals of the project and method used to construct it. He explained further how the three pillars of sustainability - environmental, economical and social – were achieved through the project. Waleed emphasized on how the social sustainability aspect of the project and the importance of engaging the community in the construction of the resort. In the final week Zahraa Ali Baba shared her experience on the role of knowledge in informing the shape of our cities in her lecture titled: Forms of common Knowledge. She discussed her involvement in various projects that studied the relation between common knowledge and space. One of the projects was Kethra, Kuwait’s first Pavilion at Venice Biennale 2012. Another project was her research on the concept of Diwaniya, the social political space of Kuwait. She also discussed the memory of space and it’s effect on the common knowledge of citizens of the space of the city of Kuwait. The AIA ME inaugurated its launch event in Amman, Jordan in November 2014 with its two lecture program “Sustainable Design Solutions”, which focused on issues of sustainable architecture and landscape, green design principals and creative solutions for more sustainable environment. The events were held at CAFE GRAFFITI, and in partnership with Jordan GBC, Architectural Forum and Edama. Dr. Saleem Dahabreh, an instructor at the University of Jordan, presented “Greening our Buildings” lecture on Saturday 22nd Nov. 2014, which focused on the essential principals for designing a green building such as optimal site orientation and building layout, and selection of appropriate material and construction methodology to reduce energy consumption and impact on the environment. The 2nd lecture held on Saturday December 6, 2014, lecture titled “Opportunities for sustainable urban landscape: Urban infill and livable streets” was presented by Dr. Anne Gharaibeh, founder and head of architecture department in Yarmouk University-Irbid, Jordan. Dr. Anne discussed the use of urban infill to create more livable neighborhoods through collecting water in vacant lands at different locations throughout the cities and the opportunities to turn them into interactive places and walkable streets. 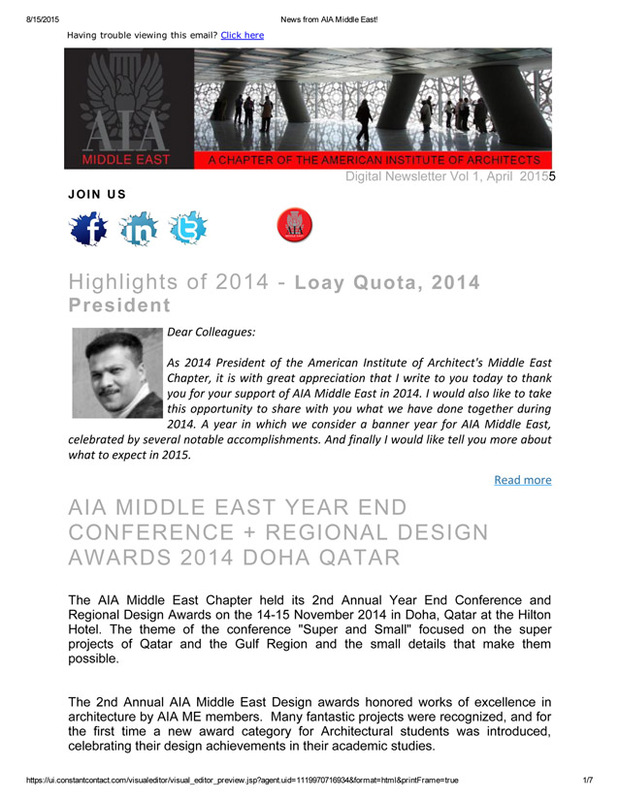 The AIA Middle East Chapter held its 2nd Annual Year End Conference and Regional Design Awards on the 14-15 November 2014 in Doha, Qatar at the Hilton Hotel. The theme of the conference “Super and Small” focused on the super projects of Qatar and the Gulf Region and the small details that make them possible. The first day of the conference featured architectural presentations by distinguished professionals and scholars, and was chaired by 2014 AIA Vice President Thomas Vonier FAIA. Lectures presented included the renovation of Souq Waqif by Artist Mohamed Ali Abdulla, Cultural Advisor to H.H Emir of Qatar, and Ameena Ahmadi, Director of Qatar Foundation’s Capital Projects reviewed the architectural type and Diversity within Education City’s Campus. Hiroshi Okamoto AIA, IM Pei former Senior Designer, gave a presentation about the challenges faced during the construction of the Islamic Museum. 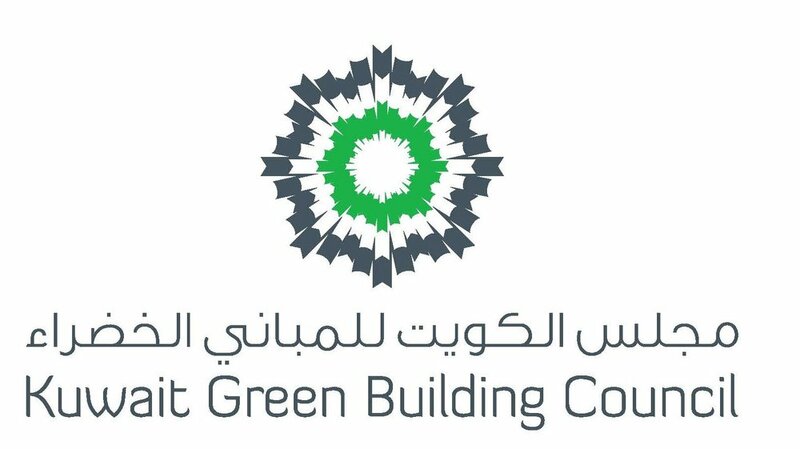 Dr. Yousef Al Horr, chairman of GORD focused on how GSAS was developed to address the environmental challenges in the GCC and MENA region, and what are the environmental, societal and economic benefits of adopting GSAS best practices. Selma Maroufi of OMA and Matthew Utley of Grimshaw Architects presented some of the exciting projects undertaken by their respective firms. The first day culminated with the Design Awards Ceremony and Gala Dinner that took place at the Msheireb Enrichment Center. We were also pleased to have AIA International Region Vice President James Wright, AIA in attendance. The second day offered a full day program of guided tours to outstanding landmark projects of architectural grandeur in Qatar designed by renowned architects, such as the Doha Tower by Jean Nouvel; Islamic Museum by I.M Pei and Qatar National Convention Center by Arata Isozaki, and concluded with a walk thru and dinner at Souq Waqif. The conference program was a resounding success and received good reviews from the attendees and participants which included 2015 AIA President Elizabeth Chu Richter, FAIA. The 2nd Annual AIA Middle East Design awards honored works of excellence in architecture by AIA ME members. The Jury included George Kunihiro, FAIA Director on the AIA Japan Chapter, Bertrand Coldefy, AIA President-elect of the AIA Continental Europe chapter, Christian Low AIA President of the AIA Hong Kong Chapter and was chaired by Steven Miller FAIA Fellow ship Director of the AIA ME chapter. Many fantastic projects were recognized, and for the first time a new award category for Architectural students was introduced, celebrating their design achievements in their academic studies. As 2014 President of the American Institute of Architect's Middle East Chapter, it is with great appreciation that I write to you today to thank you for your support of AIA Middle East in 2014. I would also like to take this opportunity to share with you what we have done together during 2014. A year in which we consider a banner year for AIA Middle East, celebrated by several notable accomplishments. And finally I would like tell you more about what to expect in 2015. We had our second AIA Middle East Year End Conference, Super and small, held in Doha, Qatar. In our many, presentations focused on topics we face in our day to day lives, we celebrated those ideas which make working in the region stimulating, distinctive and meaningful. Attendees were able to meet and listen to a presentation from our chairman, 2014 AIA Vice President Thomas Vonier FAIA on the UIA. Also a list of great lectures from Hiroshi Okamoto AIA of IM Pei, Selma Maaroufi of OMA, Ameena Ahmadi from Qatar Foundation and many others. 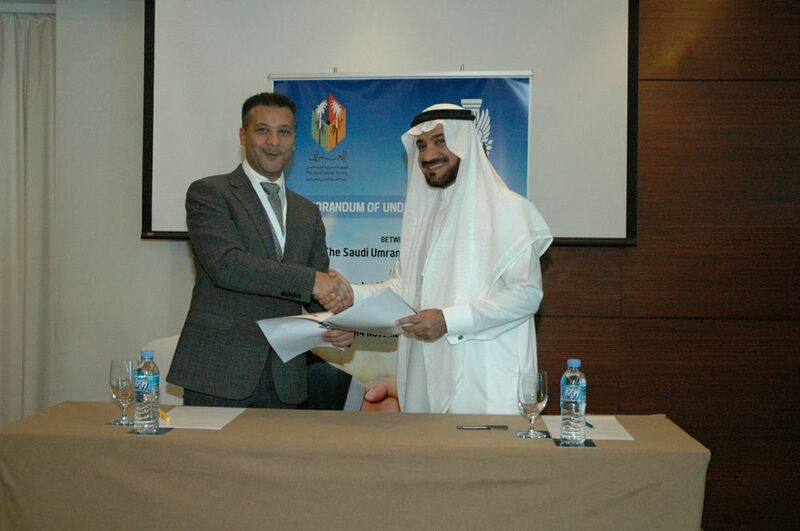 The conference also commemorated the signing of a MoU between the AIAME and both The Saudi Umran society and GORD, paving the way for fruitful future opportunities between both organizations. The conference's second day was scheduled full of iconic and significant building tours in Doha such as Doha Tower, several buildings at Education city, Museum of Islamic Art and finally culminating in a fascinating walking tour at Souk Wagif. We were also delighted to have 2015 AIA President-Elect Elizabeth Chu Richter FAIA join us on Day two. 2014 marked our second annual AIA Middle East Design Awards. The Jury included George Kunihiro, FAIA Director on the AIA Japan Chapter, Bertrand Coldefy, AIA President-elect of the AIA Continental Europe chapter, Christian Low AIA President of the AIA Hong Kong Chapter and was chaired by Steven Miller FAIA Fellow ship Director of the AIA ME chapter. Many fantastic projects were recognized, and for the first time we introduced a new award category for Architectural students, celebrating their design achievements in their academic studies. Also to mention, that with your continued support in 2014 we have been positioned to boast the fact that we are the largest international chapter outside the USA. Reaching approximately 400 members covering the entire Middle East region. An indication of our increasing exposure and a sign that we will have to work even harder to meet your expectations. With the chapter increasing in size and by gaining more members further out in the Middle East region. We found it important to assign more country representatives across the Middle East. Thus we assigned AIA ME country representatives in Qatar, Bahrain, Jordan, Egypt and Lebanon. This will give us the ability to reach out to our members in those countries, provide them with more services, hear their concerns and also reach out easily to the architectural community in those countries. I am confident that our next board led by the AIA Middle East's 2015 President Tannar Whitney AIA, and Vice President Sherif Anis AIA, will continue taking us to greater levels of success, with more conferences, more general services, developing our presence in our existing countries and reaching out to other countries and also increasing our membership numbers. With my term coming to an end, I look forward to working with the new AIA Middle East Board in various capacities - I will remain on the chapter's Executive Committee and will also take on the position of country representative for Saudi Arabia. I would ask that you please support your new board and get involved in growing your chapter by contributing with whatever time you have to offer. Again, It has been a true honor to serve as President and I wish you and your loved ones and most particularly AIA MIddle East's sponsors a very happy healthy and prosperous New Year. Thank you for your continued commitment to the AIA, design excellence and your investment in the future of our region. The American Institute of Architects and the International Trade Administration held a trade mission to Doha, Qatar on November 18th and 19th, with a stop in Riyadh, Saudi Arabia. The purpose of this mission was to introduce small and mid-size U.S. firms to the expanding and diversifying Qatari and Saudi markets. The trade mission to Qatar was led by Robert Dunn Senior Commercial Officer from the US Embassy in Doha with local AIA Middle East assistance provided by Thierry Paret, FAIA. The AIA delegation included 2014 First Vice President Elizabeth Chu Richter, FAIA who accompanied by Senior AIA National Staff and 14 American firms taking part in the trade mission. The three days included multiple opportunities for firms to meet potential local partners firms and government authorities and developers. These meetings took the form of “speed dating” sessions and presentations given by influential clients in Qatar and Saudi Arabia. The trade mission also included visits to key large scale ongoing developments in Qatar such as Qatar Foundation’s Education City and Lusail City. The highly successful and informative three day mission concluded with a wonderful reception held under the stars at American Ambassador Dana Shell Smith’s residence in Doha. Lunch at IM Pei's Islamic Museum with AIA President ElizabethChu Richter, FAIA (Right Center) and AIA Middle East Qatar Country Representative Thierry Paret, FAIA.